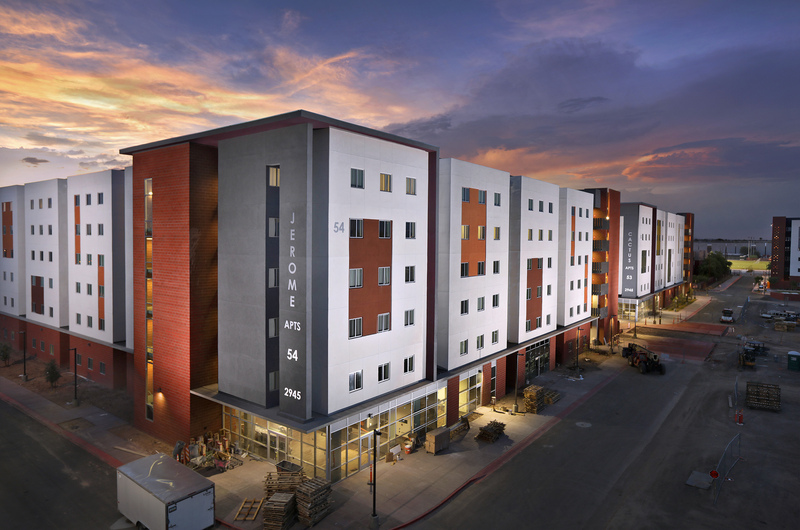 Jerome and Cactus are beautiful new apartments populating the east side of the Grand Canyon University campus; their 1,200 beds add to an extraordinary growth that has boosted the number of residence halls to 20. While it is common for students at many universities to move off campus after their freshman or sophomore years, thousands of upperclassmen stay on GCU’s campus for accessibility to classes, activities, and friends, while their parents are comforted by the safety and affordability of living on campus. 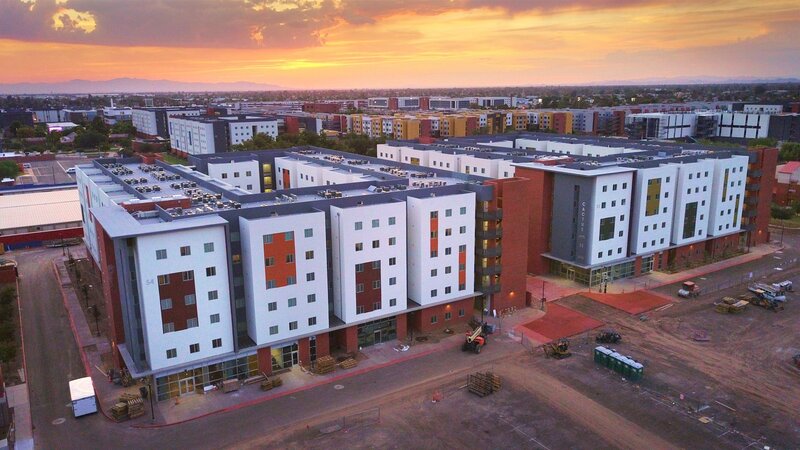 The expansion of the east side to 2,400 beds brings the total number of students living on campus to a GCU-record 12,000 in 2018-19. Although part of the expansion can be attributed to the overall growth of students enrolling in the ground campus, a significant factor driving resident growth is the culture that has been forged on campus. Jerome and Cactus, which open Wednesday, are reserved for returning students and feature two floor plans, both with two bathrooms: three bedrooms for three students and four bedrooms for four students. Each suite has a living room and fully equipped kitchen. Hopkins arrived at GCU in 2012 and served one year as Judicial Officer — a position that has been renamed Conduct Manager — before taking over as Director of Residence Life in December 2013. A graduate of Moody Bible Institute in Chicago and a passionate Chicago Cubs fan, Hopkins earned a bachelor’s degree in Pastoral Studies and a master’s degree in Divinity. He and his wife relocated to Phoenix for the weather, and he accepted the job at GCU for the opportunity to work with college students. Increasingly, his job takes him over to the east side of campus. Junior Alexander Cortez lived in Agave in 2017-18 and thoroughly enjoyed the experience. Cortez played intramural flag football and soccer with a variety of students and pickup basketball games with close friends. When he wasn’t making connections outside, he established bonds through Bible study with his Life Group in Agave. The biomedical engineering major from Visalia, Calif., lived in Juniper Hall, on the west side of campus, his freshman year and will move into Encanto Apartments in August. 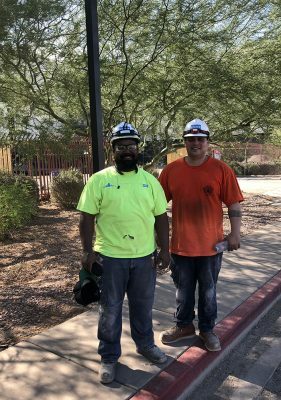 While attending summer school, David Whitaker Jr. has watched the construction of his future home, Cactus Apartments. 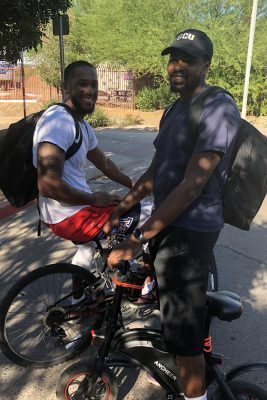 The senior business administration major plans to ride his bike to main campus classes and events and walk to CCOB, where most of his classes will meet. “It’ll take only a few minutes because my dad raised me to have a pep in my step wherever I go,’’ he said. The east side expansion will continue in the fall of 2019 when three more apartment buildings are planned for south of Diamondback Apartments, along with a swimming pool. Also, Colter Circle pedestrian walkway is set to be enlarged, increasing access behind the pair of Papago Apartment buildings, and a new entry point to campus will open via a bridge across the canal paralleling Little Canyon Trail. Hopkins praised the work of Rich Oesterle, Director of Campus Development and Facilities, and Butch Glispie, owner of Pono Construction, the company erecting the new structures. “These guys are magicians in putting up buildings that look great, and doing so in the heat,” Hopkins said. 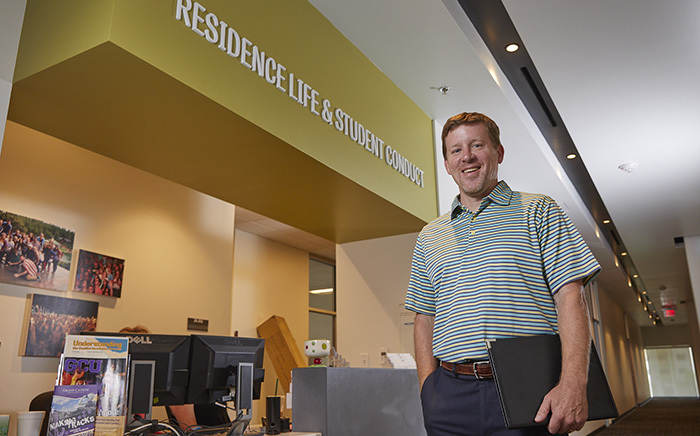 The eastward expansion has necessitated a change in the check-in process for students moving into their rooms during Welcome Week, which begins Aug. 20. An extra point of entry has been added for drivers: one for the east side and one for the main side. First-year and transfer students will be unpacking in record numbers — 6,000 compared to 4,700 last year, according to Hopkins. “The freshman class is continuing to grow, so we need more beds and more buildings,’’ Hopkins said, citing several factors escalating the demand for on-campus housing among all grade levels. The on-campus culture is palpable. The Community Learning Plan (CLP) was implemented two years ago to build culture on campus. It emphasizes education as the priority and fosters Christian service leaders through self-awareness and consideration of others, including roommates and floormates. Hopkins is joining with Residence Life Managers Jesi Weeks, Kris Hayes, Holly Neely and Stephen Wahlstrom; Conduct Manager Brent Bailey; Conduct Coordinators Kayla Fonseca and Garrett Morte; 41 Resident Directors; and three Assistant RD’s for two weeks this month to train the dozens of Resident Assistants (RA’s) in the ways of CLP. Campus is definitely the place to be. On any given night at GCU, whether it is 7 p.m. or 11 p.m., the intramural fields are bathed in light and filled with students playing a variety of sports. They are laughing, sweating and calling out to each other. It is clean, safe fun, typical of a great place to live.